Run Time: 93min Rated: G (Canada), Rated PG (MPAA) for mild action and rude humour. SpongeBob SquarePants (Tom Kenny) is an innocent, gullible cartoon kitchen sponge who lives in a pineapple at the bottom of the sea in a town called Bikini Bottom. He works at the The Krusty Krab, a greasy spoon restaurant owned by the greedy Mr. Krabs (Clancy Brown) that serves an ambrosia-like burger to the town’s residents. Everyone in Bikini Bottom, including SpongeBob’s friends Patrick Star (Bill Fagerbakke) the lazy sea star, and Sandy Cheeks (Carolyn Lawrence) a squirrel, must eat the Krabby Patty burgers multiple times a day or the fabric of society will unravel. The recipe for the Krabby Patty is a closely-guarded secret and the envy of a competing restaurateur Plankton (Mr. Lawrence) who runs the dismally unsuccessful Chum Bucket restaurant. Plankton's envy drives him to attempt to steal the secret Krabby Patty recipe from Mr. Krab’s vault. For the uninitiated this cartoon world will sound very strange, but wait there's more! 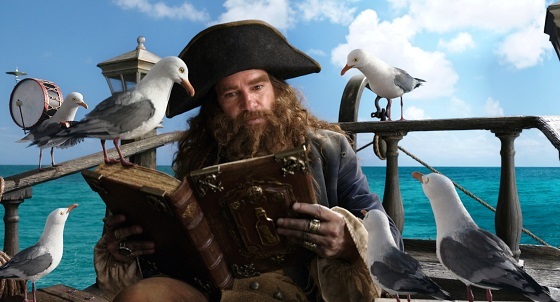 Plankton's plot to steal the secret Krabby Patty recipe is thwarted by a live-action pirate, Burger Beard (Antonio Banderas), who with the aid of a re-writable magic book containing the life story of SpongeBob SquarePants steals the secret recipe for his own use and opens a beach-side food truck in the real world. 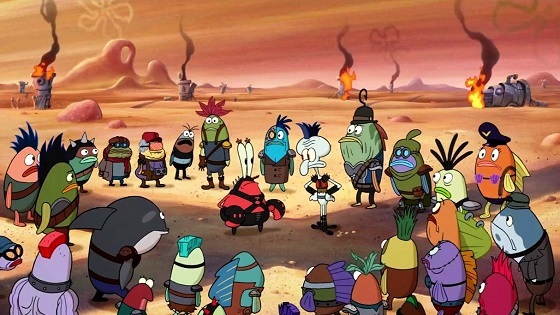 SpongeBob and his friends must band together and with the help of a time machine, Bubbles an interdimensional talking/rapping dolphin, and Plankton their arch nemesis, and enter the real world to retrieve the recipe to save Bikini Bottom from a Mad Max-style post-apocalyptic existence. Hence the film’s title: The SpongeBob Movie: Sponge Out of Water. Paul Tibbitt's film charts a meandering course on the high seas of comedy in this very silly movie. As might be expected the plot is not the most central driving force and the film often detours into random sight gags and general weirdness. 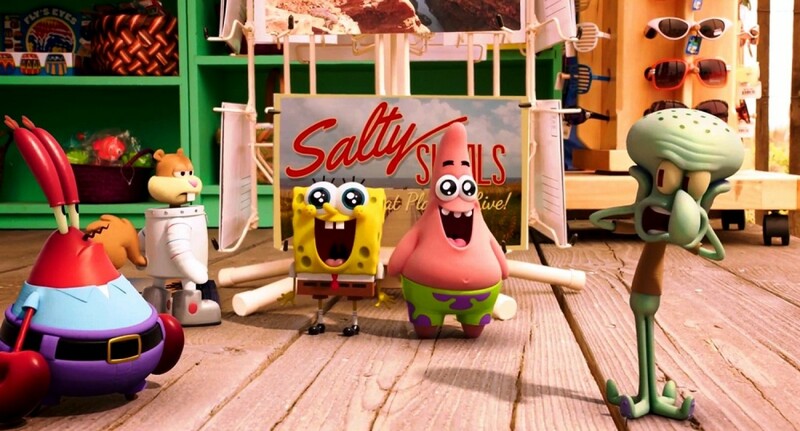 However, the animation is fun, bright, colourful, and features a combination of traditional-style animation found in the original SpongeBob SquarePants TV Series and the 3D computer animation made popular by Toy Story(1995) which has since become the standard for children's animated films. Tibbitt does an admirable job weaving these styles together with the live action and seeing traditional animation done in 3D is quite enjoyable. The film’s visual aspects are the most compelling elements outshining the humour and story. 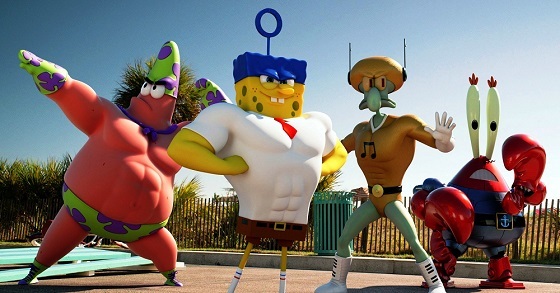 If a viewer walked into this film with no prior knowledge or experience with the world of SpongeBob SquarePants it will likely feel like showing up at a party populated by close friends who have years-worth of inside jokes at their disposal; everyone is laughing while the newcomer struggles to see all the humour. Some of the movie’s humour works regardless of the inside nature of the jokes. 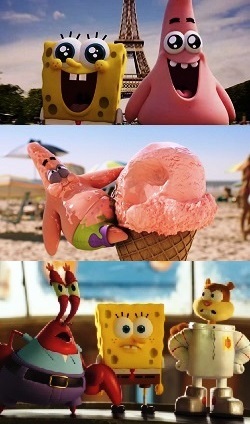 One memorable moment is when the cartoon characters discover cotton candy in the "real world" and SpongeBob and his best friend Patrick experience an intense sugar rush. Both parents and children can relate to this funny episode! Is there anything for Christians to bite into in this film or is it all cotton candy? As in the TV series many of the characters in the ensemble have rather obvious character traits. Mr. Krab's greed and Plankton's envy provide easy object lessons to talk with kids about the destructive nature of coveting. 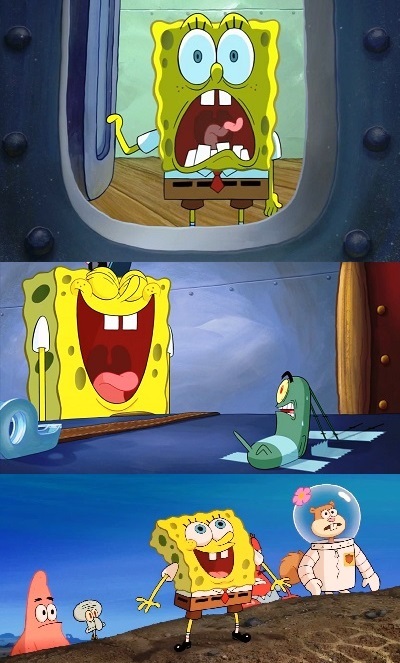 At points, Sponge Out of Watertalks about good and evil and one of the most compelling parts of the film is the lesson the envious Plankton learns about teamwork. This is rather standard children's movie material and leans heavily towards a general kind of moralism and works righteousness but it can still be an effective starting point to talk about selfishness. The more compelling part of the film is found in a small subplot. SpongeBob's friend, Sandy Cheeks the squirrel, in the midst Bikini Bottom's apocalyptic Krabby Patty shortage comes to the conclusion that the "sandwich gods" had stolen the secret recipe and the "sandwich gods" needed a sacrifice to be appeased to return it. The audience knows there are no "sandwich gods" but the town folk of Bikini Bottom buy into it and SpongeBob offers himself to be the sacrifice. On the one hand this is the most cynical spot in the film and may be a not-so-subtle dig at religion painting it as an irrational response to a real-world problem. In this case, "real-world problem," is the loss of the Krabby Patty - the very thing that makes life worth living - without which the inhabitants of Bikini Bottom live in a world of suffering, death and chaos. On the other hand the "innocent" nature of SpongeBob and his willingness to sacrifice himself for the good of the community points to Jesus' willingness to be sacrificed for all people. As Hebrews 12:2 says, Jesus, "for the joy that was set before Him endured the cross, despising the shame, and is seated at the right hand of the throne of God." The difference is that the very real Jesus died on the cross and rose from the dead for sinners while the very fictional SpongeBob did not. The thing to point out is SpongeBob's willingness to "lay his life down for his friends"—a character trait Jesus highly valued. 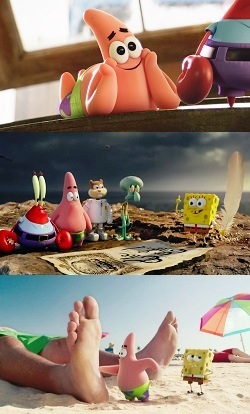 Within the film SpongeBob SquarePants is shown as a character possessing great love for everyone and everything, he is also depicted as being rather innocent. That being said, his “innocence” comes off more like naiveté. While Jesus is innocent He is not naïve and, while He has great love for everyone and everything, He doesn’t share SpongeBob's childlike simplicity. If parents wish to use SpongeBob as an object lesson to start a more serious discussion about Jesus and the nature of self-sacrifice they will want to be careful to remember that all analogies eventually break down and silly analogies might break down the fastest! In Luther's Table Talk, Dr. Luther is quoted saying that “the devil can be chased away by scorn and crazy jokes.” Perhaps the “crazy jokes” of The SpongeBob Movie: Sponge Out of Water can chase away the "devil" of February! The film seems just what people are looking for at the box office this time of year. Fans will feel at home in this shallow comedy’s silly waters, while bemused newcomers may be left asking themselves, “What was that? That was crazy!” Either way, Tibbitt and Stephen Hillenburg give the strong impression that they're more than happy to give any and all viewers another guided tour of their odd world of SpongeBob SquarePants—both in the water and out! Weimarer Ausgabe, Volume 6 of the Tischreden (TR 6, 1921), pp. 210-211.